Gregg Bordowitz is a writer, AIDS activist, and film- and videomaker. 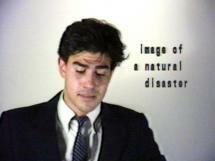 His work, including Fast Trip, Long Drop (1993) and Habit (2001), documents his personal experiences of testing positive and living with HIV within the context of a personal and global crisis. His writings are collected in The AIDS Crisis is Ridiculous and Other Writings:1986-2003. He is currently Director of the Low Residency MFA program at the School of the Art Institute of Chicago.